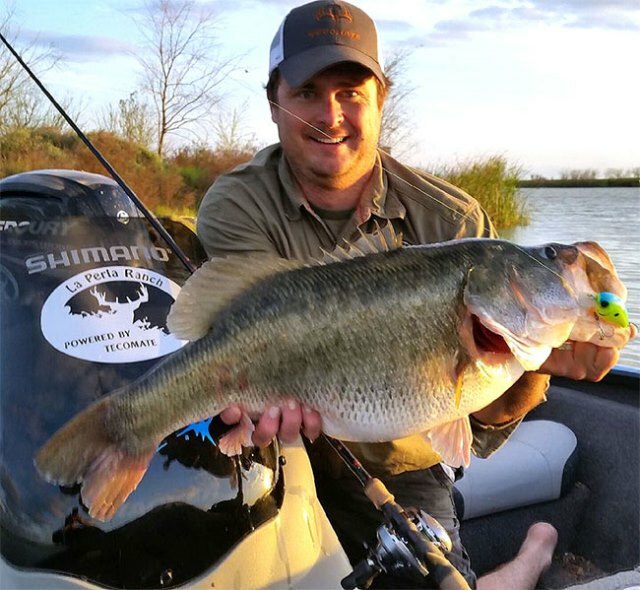 In recent years, bass fishing fans have become familiar with a ranch deep in the heart of South Texas, the La Perla Ranch owned by Tecomate Seed Company founder and Outdoor Channel television show personality Dr. Gary Schwarz. In an effort to produce a future world-record-class largemouth bass, Schwarz and company have embarked on an ambitious program to manage the bass fisheries on the ranch for optimum growth and size by way of maximizing and supplementing the nutrition sources available to bass on the ranch better known for its big white tailed deer. Like the results seen in tilapia stocked bass lakes in Mexico and rainbow trout stocked bass lakes in southern California, whatever Schwarz and his biologists are doing at La Perla, it seems to be working. That much seems evident after Gary's son Blair Schwarz caught a 14.3-pound (14-pound, 5-ounce) largemouth while fishing one of the ranch lakes, a fish that was promptly donated to the Texas Parks and Wildlife Department's ShareLunker program.